Students and instructors alike will find this organized and detailed approach to quantum mechanics ideal for a two-semester graduate course on the subject. 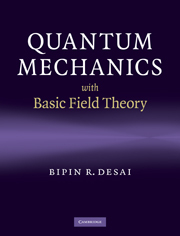 This textbook covers, step-by-step, important topics in quantum mechanics, from traditional subjects like bound states, perturbation theory and scattering, to more current topics such as coherent states, quantum Hall effect, spontaneous symmetry breaking, superconductivity, and basic quantum electrodynamics with radiative corrections. The large number of diverse topics are covered in concise, highly focused chapters, and are explained in simple but mathematically rigorous ways. Derivations of results and formulae are carried out from beginning to end, without leaving students to complete them. With over 200 exercises to aid understanding of the subject, this textbook provides a thorough grounding for students planning to enter research in physics. Several exercises are solved in the text, and password-protected solutions for remaining exercises are available to instructors at www.cambridge.org/9780521877602. Preface; 1. Basic formalism; 2. Fundamental commutator and time evolution of state vectors and operators; 3. Dynamical equations; 4. Free particles; 5. Particles with spin 1/2; 6. Gauge invariance, angular momentum and spin; 7. Stern-Gerlach experiments; 8. Some exactly solvable bound state problems; 9. Harmonic oscillator; 10. Coherent states; 11. Two-dimensional isotropic harmonic oscillator; 12. Landau levels and quantum Hall effect; 13. Two-level problems; 14. Spin 1/2 systems in the presence of magnetic field; 15. Oscillation and regeneration in neutrino and neutral K-mesons as two-level systems; 16. Time-independent perturbation for bound states; 17. Time-dependent perturbation; 18. Interaction of charged particles and radiation in perturbation theory; 19. Scattering in one dimension; 20. Scattering in three dimensions - a formal theory; 21. Partial wave amplitudes and phase shifts; 22. Analytic structure of the S-matrix; 23. Poles of the Green's function and composite systems; 24. Approximation methods for bound states and scattering; 25. Lagrangian method and Feynman path integrals; 26. Rotations and angular momentum; 27. Symmetry in quantum mechanics and symmetry groups; 28. Addition of angular momenta; 29. Irreducible tensors and Wigner-Eckart theorem; 30. Entangled states; 31. Special theory of relativity: Klein Gordon and Maxwell's equation; 32. Klein Gordon and Maxwell's equation; 33. Dirac equation; 34. Dirac equation in the presence of spherically symmetric potentials; 35. Dirac equation in a relativistically invariant form; 36. Interaction of Dirac particle with electromagnetic field; 37. Multiparticle systems and second quantization; 38. Interactions of electrons and phonons in condensed matter; 39. Superconductivity; 40. Bose Einstein condensation and superfluidity; 41. Lagrangian formulation of classical fields; 42. Spontaneous symmetry breaking; 43. Basic quantum electrodynamics and Feynman diagrams; 44. Radiative corrections; 45. Anomalous magnetic moment and Lamb shift; Appendix; References; Index.